We aim to foster a life-long love of language and literature in all its forms through reading, writing, speaking, performing and listening. We strive to create a happy, purposeful literary environment where each child is nurtured and encouraged to find the stories, books and authors she loves. We invite authors in to talk to the girls and organised a week long Literacy Festival in the summer of 2017. At the heart of our English teaching is a love of reading and the belief in the power of the written word. The shared class text, whether story, poetry, non-fiction or play, is used to stimulate their imagination; to arouse an interest in the writer’s craft and the use of language; to develop a discriminating critical faculty and to enhance the powers of communication and expression in all its forms. This shared text, whether Shakespearean or contemporary, printed or electronic, provides the opportunity to look both out towards society and the needs of a rapidly changing world, as well as in towards the development and understanding of self. English is taught in classes which are broadly streamed and involves working as a whole class, in small groups and independently. The small class sizes allow for much individual teacher attention. A broad range of resources is used including written material, pictures, photographs, DVD recordings, CDs, the internet and the beautiful and inspiring environment of Hanford. 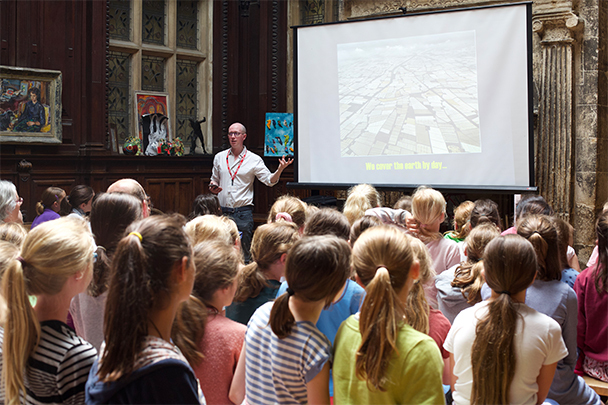 Theatre trips, school plays, the library and opportunities to write for a wider audience all contribute to the English curriculum, and flexibility and responding to the moment are seen as integral elements of a successful lesson; nothing is ever set in stone. Throughout the year girls have plenty of opportunities to act, either in their form play, The Nativity or The Summer Play on Parents Day. Theatre trips take place on a regular basis to the local venues such as The Octagon Yeovil, Salisbury Playhouse and The Lighthouse, Poole. 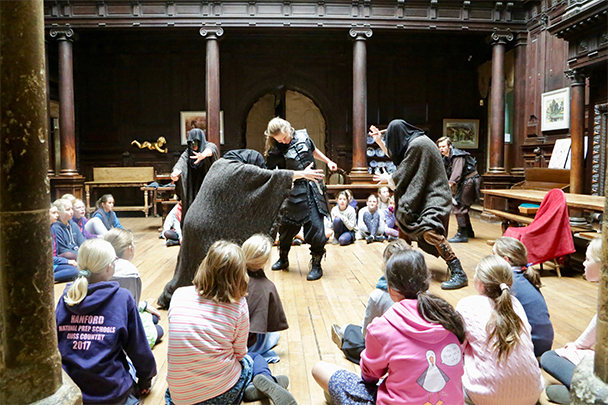 One of the highlights of the year must the performance by The Young Shakespeare Company in the Hall where they take the girls step by step through the play explaining the language, motivation and meaning of various scenes. Hanford organised a week long Literary Festival in the summer of 2017. During the course of the week 14 authors hosted a staggering 27 talks and events. Highlights included one of our old girls, Santa Montefiore, returning to inspire a new generation of Hanford girls to write. Other highlights were Joanna Trollope sharing her passion for Jane Austen, Piers Torday talking about animals past, present and imaginary and Natasha Solomons explaining how the Dorset landscape can influence a writer. Damien Lewis brought a different, more gritty dynamic towards the end of the week, demonstrating how real and powerful events can be turned into dramatic fiction. Our closing speaker was the incomparable Philip Reeve who entertained with readings from his latest ‘Railhead’ series. Thanks also go to Olivia Tuffin, Maria Farrer, Emily Hennessey, David Solomons, Rebecca Westcott, Linda Coggin, Julia Golding, Adrian Boote and Lucy Bentley. The library is situated in the main house, is ‘open’ all the time and is a place where girls and staff can read for pleasure, more or less whenever they wish. Although a member of the English Department is in the library each day after lunch to help with book selections, the girls are encouraged to be independent in their use of the library, to be responsible for the signing out and returning of books and to play an active role in the purchase of new stock. Increasingly, the library is also being seen as a place where independent research can take place. The acquisition of a large number of new and up-to-date non-fiction texts is ongoing and provides a very useful learning resource across all subjects in the curriculum. Above all, the library provides a sanctuary, a place of peace and quiet away from the often hectic pace of boarding school life, where girls can relax, sink into sofas and immerse themselves in the magic of imaginary worlds. On the left-hand side of the page you will find some useful reading lists for children. These reading lists for young people have been carefully chosen by Hanford’s English department. They are useful lists for young readers including many popular titles and some more traditional works. To download a list click on the download PDF box on the page.